Because trainer-teacher-learners are faced with and often focused on short-term, day-to-day pressures to produce new learning content—NOW!—we all-too-rarely take time to explore what the best peer-reviewed articles and open content might offer us in our efforts to produce more effective learning opportunities for those we serve. The newly-released New Media Consortium (NMC) Horizon Project educational-technology report on libraries inspires us to look beyond that narrow field of vision. It is a fabulous tool that also helps us remember that we are part of “an expansive network of education collaborators” that can help connect us to “researchers, faculty, and librarians who are creating, adapting, and sharing media—and numerous repositories brimming with content” (p. 40). While the focus on academic and research libraries within the NMC Horizon Report > 2014 Library Edition means that report is often directed at those working within those types of libraries, the content within the section about technologies “very likely to drive technology planning and decision-making” in academic and research libraries during the next two or three years can easily be adapted to any trainer-teacher-learner interesting in exploring ways to apply educational-technology developments to the work we do in a variety of settings. The first of those two technologies—bibliometrics and citation technologies—would, at first glance, appear to be of far more interest to those working in academic and research libraries than to those in other types of libraries and other training-teaching-learning organizations. But a quick skim of the section, with its summary of tech developments that help us “better gauge an author or journal’s impact,” reminds us that there are plenty of ways for us to sift through the drinking-from-the-fire hose flow of information that threatens to drown us. There is, for example, an introduction to altmetrics—an alternative to bibliometrics that “takes into account a scholar’s online social media imprint as well as their ability to publish their own research in repositories and disseminate it though blogging or other avenues” (p. 38). If you’ve been relying on Facebook and LinkedIn likes and Twitter links to online resources when you’re trying to keep up with new developments, you’re going to find altmetrics to be a tremendous upgrade in terms of leading you to thoughtful, well-developed resources that keep your knowledge current. And if you want to further understand and use bibliometrics to your advantage—and the advantage of those you serve—you might also want to move beyond the report’s summary and skim David A. Pendlebury’s white paper on “Using Bibliometrics in Evaluating Research.” His simple observation, on page 7 of the paper, that “the goal of bibliometrics is to discover something, to obtain a better, more complete understanding of what is actually taking place in research,” helps us understand why bibliometrics is a topic we ought to be exploring more frequently and more diligently. We come full circle by following a link from the report to Mike Taylor’s “Towards a Common Model of Citation: Some Thoughts on Merging Altmetrics and Bibliometrics,” an opinion piece published in the December 2013 issue of Research Trends. Moving into the second two- to three-year horizon technology—open content—we’re on much more familiar ground: “Open content uses open licensing schemes to encourage not only the sharing of information, but the sharing of pedagogies and experiences as well….As this open, customizable content—and insights about how to teach ad learn with it—is increasingly made available for free over the Internet, people are learning not only the material, but also the skills related to finding, evaluating, interpreting, and repurposing the resources” (p. 40). 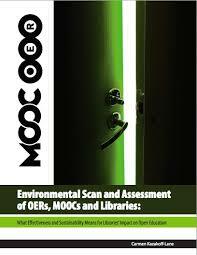 We come across reminders that “open” means far more than “free of charge”: it refers to learning resources that “are freely copiable, freely remixable, and free of barriers to access, cultural sensitivities, sharing, and educational use” (p. 40). Our models are increasing visible and, under the right conditions, appealing: massive open online courses (MOOCs), when they are well-designed and well-facilitated; open textbooks and textbooks that are evolving to provide engaging learning opportunities; and colleagues within libraries and other learning organizations where development of open educational resources is increasingly being explored and promoted. It’s obvious, as we read and reflect upon the 2014 Library Edition, that resources like this one do not need to and should not remain siloed away—read only by the obvious audience of people within academic and research libraries. The fact that the report has, within its first month of availability, already been downloaded more than a million times—the most popular Horizon Report to date in terms of initial readership—suggests that its audience extends far beyond those directly involved with academic and research libraries. And if learning facilitators worldwide are among the readers, learners worldwide are going to be the beneficiaries. This entry was posted on Wednesday, September 3rd, 2014 at 1:31 pm and is filed under libraries, technology, training. You can follow any responses to this entry through the RSS 2.0 feed. You can leave a response, or trackback from your own site.